To start with, try having a look at things like the Wiccan Rede and the Witches Creed, they are easy to find online. http://www.controverscial.com/ has them, along with stuff like the Charge of the Goddess. I think I'll do some more research into paganism (although the vastness of it seems daunting ), could you recommend an books on spells or paganism in general? I would avoid Silver Ravenwolf like the plague. She writes her books for kiddies who want to be "different" and "rebel", is patronising and I've met very few serious Wiccans who like her work. She's considered a "fluffy" writer, or was last time I checked. Cannot stand her books. Wicca is the easiest to find information on. Try books by Gerard Gardner, Doreen Valiente, Vivianne Crowley, Stewart and Janet Farrer, Scott Cunningham (though this man's scholarship is quite bad at times), Ly de Angeles and others. Avoid specific spell books, because they are usually mass-produced trash created during the big explosion in interest in paganism. I also tend to avoid anyone who has changed their name to something utterly ridiculous, like Silver Ravenwolf, Aoumiel and things like that. Any Book of Shadows available is not to be trusted, as these are generally meant to be kept secret within a coven or by a hedge witch. Not sold on the internet, etc. This website is also good: http://www.witchcraft.org/. It's a shame how many pagan websites have awful, garish colour schemes, though. Makes it hard to take them seriously at times. Ásatrú is also relatively easy to find information on, but you run the risk of getting bogged down in Neo-Nazi propaganda if you end up on the wrong sites. Do NOT go anywhere near Silver Ravenwolf. Seriously. I read some of her books before I found those articles. The articles are completely accurate. First point of call: The Triumph of the Moon: A History of Modern Pagan Witchcraft by Ronald Hutton. It's mainly a history of Wicca but it's very good for looking at how neo-paganism overall has sprung up. As for books on Wicca.. I would go with Gerard Gardner (of course), Stewart and Janet Farrer, Doreen Valiente and Vivianne Crowley. Scott Cunningham's books are usually touted as good books to read for an introduction. They can be, but they are rather fluffy in places. For Druidry I would recommend Emma Restall Orr's books and Philip Carr-Gomm's books. The one thing you have to know: Do not take one author as the gospel truth. Even within Wicca there are many different branches. The best thing you can do is just to try to read as many reputable authors as you can. Wicca is NOT Witchcraft. Witchcraft is NOT Wicca. Wiccans are NOT Witches and Witches are NOT Wiccans. Wicca is a religion. Witchcraft is the practise of magic and other things. There are so many people out there who use the two terms interchangeably and they are WRONG! Now, the vast majority of Wiccans are Witches also. But there are some Wiccans who don't practise magic. 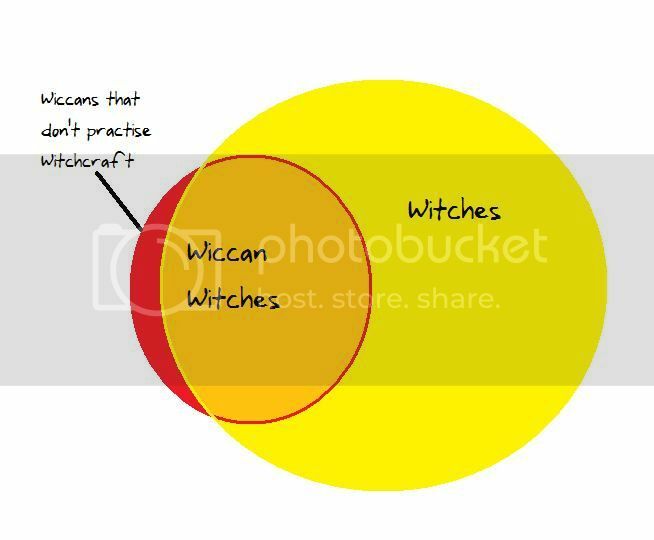 While many Witches are also Wiccan, there is a huge, huge, HUGE amount of Witches who [i]aren't[/] Wiccan. But if you listen to what those books say wicca and witchcraft are the same thing but they're not. As for other branches of paganism other than Wicca or Druidry let me know and I'll ask the people I know who are more knowledgeable about other paths what books they would recommend. Have to say, I find the concept of a Christian Witch rather strange, unless you don't want any female aspect in the spells. I've met a few and I just found their reasons behind it rather badly thought out. About the female aspect.. They've told me that in the Trinity, the Holy Spirit, to them, represents the feminine. So that's how they work it. Thanks for the recommendations I was just wondering where you guys learned magic and spells e.g: scrying? Wow some people really will buy into anything. Really? 3 male aspects somehow make a female? Fair enough. Like I said, rarely holds water in my opinion, in regards to Christian doctrine. That it works for them is great, though. Most people will be self-taught on here, I would imagine. Otherwise, they will have joined a coven and been taught. Depending on which tradition the coven follows, the training periods be different lengths. Traditionally it's a year and a day, though, for each level. I would avoid Silver Ravenwolf like the plague. She writes her books for kiddies who want to be &quot;different&quot; and &quot;rebel&quot;, is patronising and I've met very few serious Wiccans who like her work. She's considered a &quot;fluffy&quot; writer, or was last time I checked. Cannot stand her books. This website is also good: http://www.witchcraft.org/. It's a shame how many pagan websites have awful, garish colour schemes, though. Makes it hard to take them seriously at times. Ugh, why do I keep getting neg rep for the first post I made??? Probably because of the age you stated you changed your mind. Probably by atheists or agnostics who disagree, etc. Hell, I've had people reading threads from 2009 and earlier recently and been getting negs on posts I made back then. Someone gave me a neg on a thread from 2007. A powerful thread - Bombshell Babe. Look after yourself. I also do fire scrying, and water scrying..
As far as I am aware, it's looking for pictures, be it in mirrors, water, fire. Not as in 'ooh, I found Jesus's face in my toast', but entering a meditative trance and using the fire or whatever as a medium in which to see. YAY!!! MEE! Im a wiccan although all of my family are sikh or a jahovas witness.. i can say it is HARD! I dont know any other pagans so no one really understands u. Kinda funny when people think u worship the devil coz for a minite i let them beleve it!! Anyways its really good to know there are 'others' and i wish u the best in watever u choose. Blessed be! The link just linked back to this thread?